on the Files Panel, Right-click and select "Clicks From -> Clicks From /index.html". The list starting the analysis of navigation from /index.html is made. select html file and Right-click and select "Clicks From -> Clicks From selected file". The list starting the analysis of navigation from selected file is made. 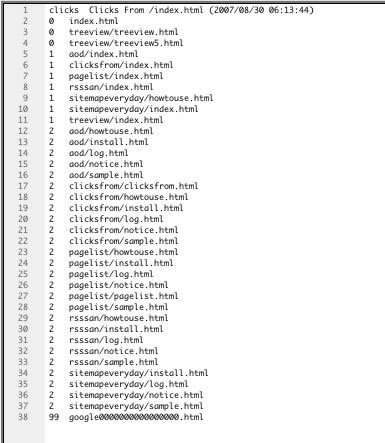 It takes time when there are a lot of numbers of pages because all links are analyzed. The list in new document. on the Files Panel, Right-click and select "Clicks From -> "make Text-based List(Tab-Separated)" -> Clicks From /index.html". select html file and Right-click and select "Clicks From -> "make Text-based List(Tab-Separated)" -> Clicks From selected file".